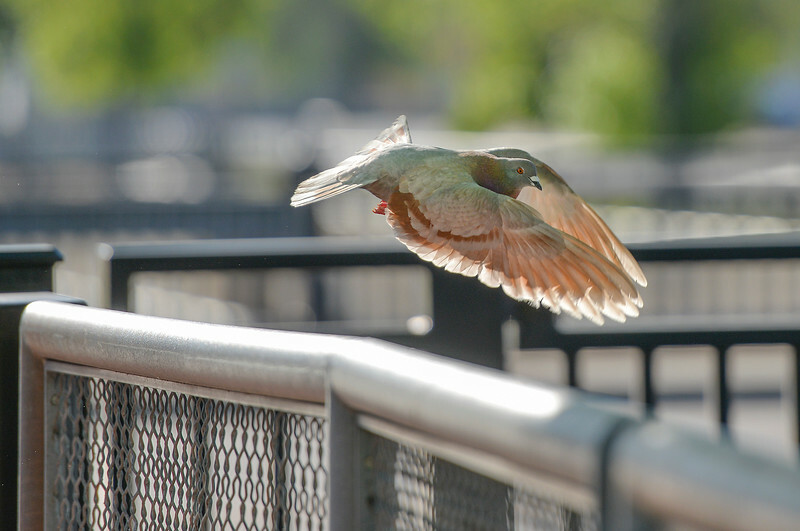 A Rock Dove launches from the rail along the Little Goose Creek on Tuesday. 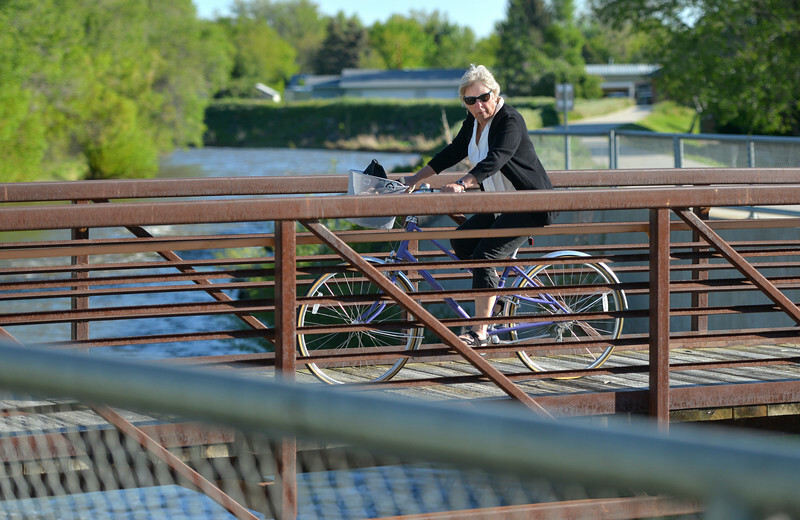 A woman rides her bicycle across a bridge over the Goose Creek Tuesday morning. Tuesday’s high will be 69, Wednesday will be 80 according to the National Weather Service. Jensen Arnold waits on a chair during the Children’s Center annual Preschool Graduation Tuesday at Sheridan Wesleyan Church. The Children’s Center had 35 students graduate, which is the largest group the preschool held. 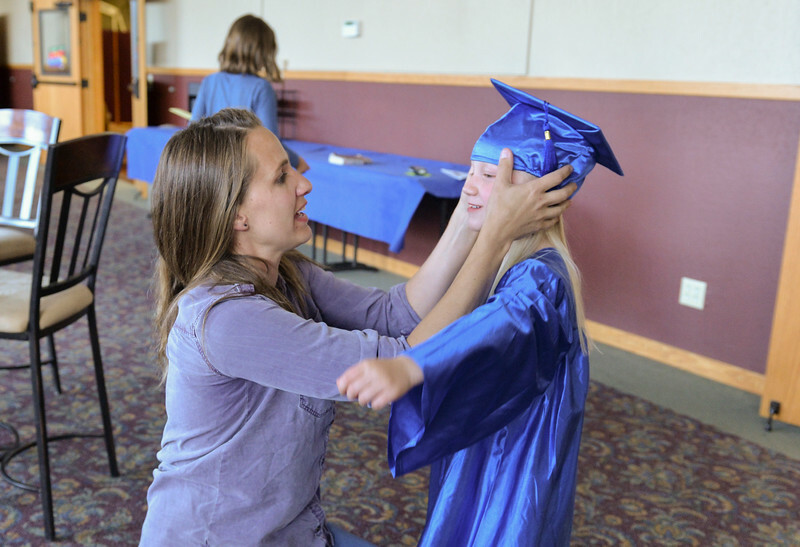 Jessie Koltiska puts a cap on her daughter Finnley Koltiska, 5, during the Children’s Center annual Preschool Graduation Tuesday at Sheridan Wesleyan Church. 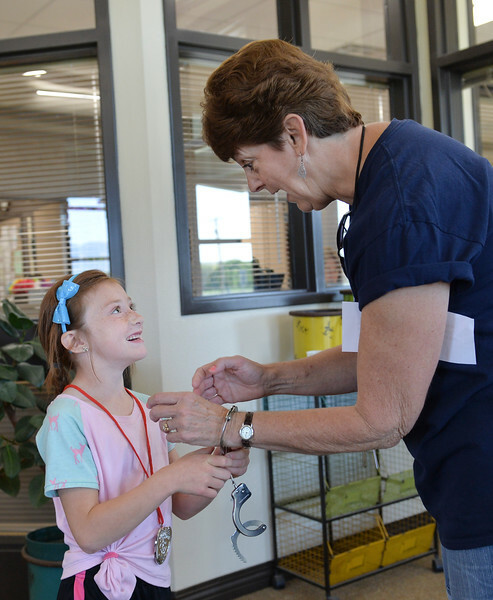 The Children’s Center had 35 students graduate, which is the largest group the preschool held. 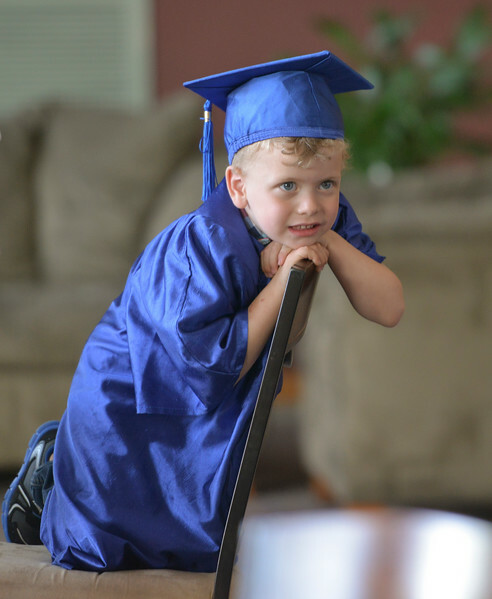 Four-year-old Jordan Clark gets ready in the lobby during the Children’s Center annual Preschool Graduation Tuesday at Sheridan Wesleyan Church. 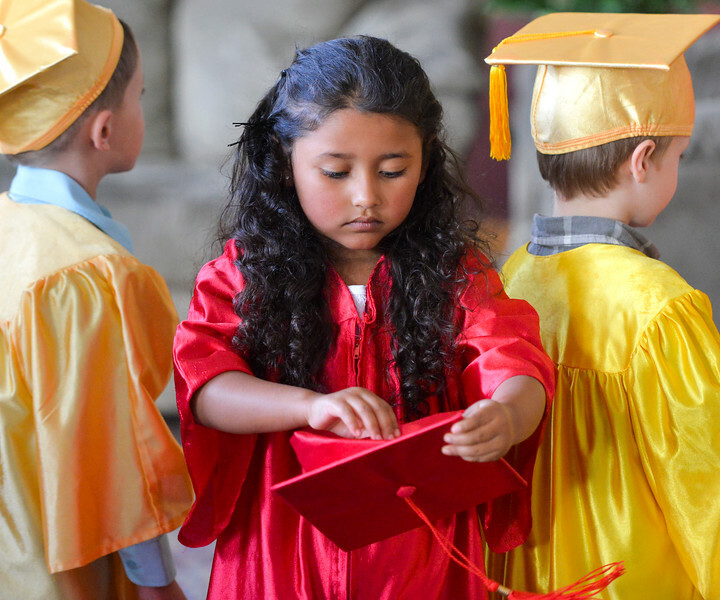 The Children’s Center had 35 students graduate, which is the largest group the preschool held. 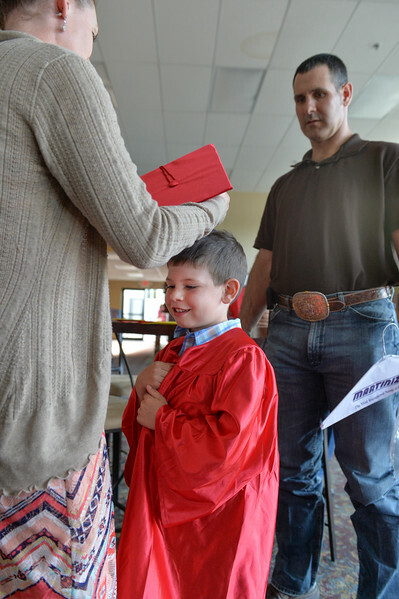 Six-year-old Joseph Panetta stands between his parents Shiann Panetta and E.J. 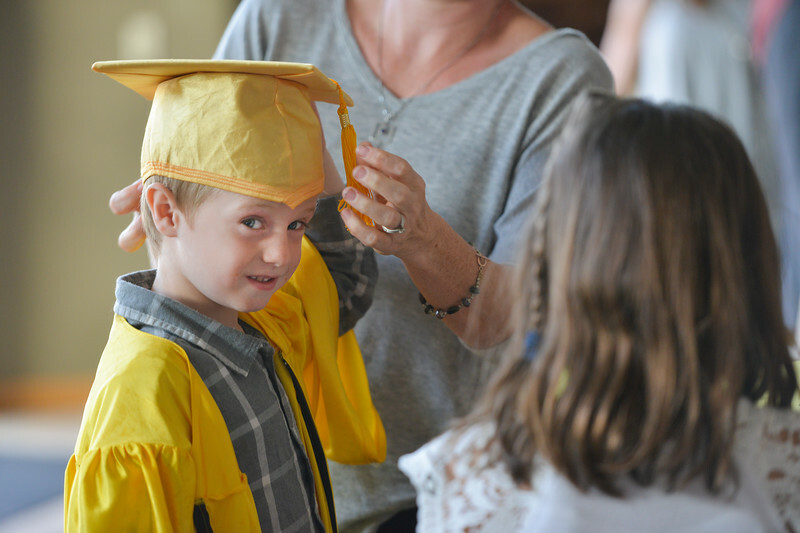 Panetta as they get him ready during the Children’s Center annual Preschool Graduation Tuesday at Sheridan Wesleyan Church. The Children’s Center had 35 students graduate, which is the largest group the preschool held. Jessica Almaraz tries to fix her cap as graduates line up outside the doors during the Children’s Center annual Preschool Graduation Tuesday at Sheridan Wesleyan Church. The Children’s Center had 35 students graduate, which is the largest group the preschool held. 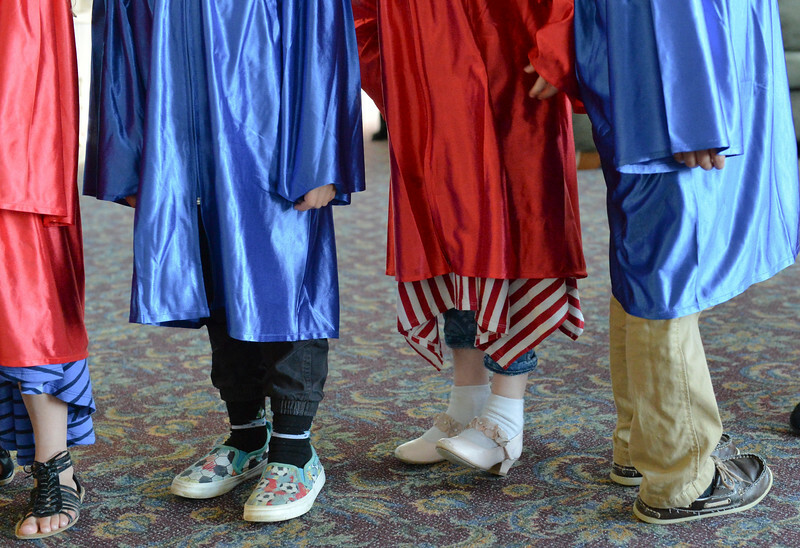 Graduates line up outside the doors during the Children’s Center annual Preschool Graduation Tuesday at Sheridan Wesleyan Church. The Children’s Center had 35 students graduate, which is the largest group the preschool held. 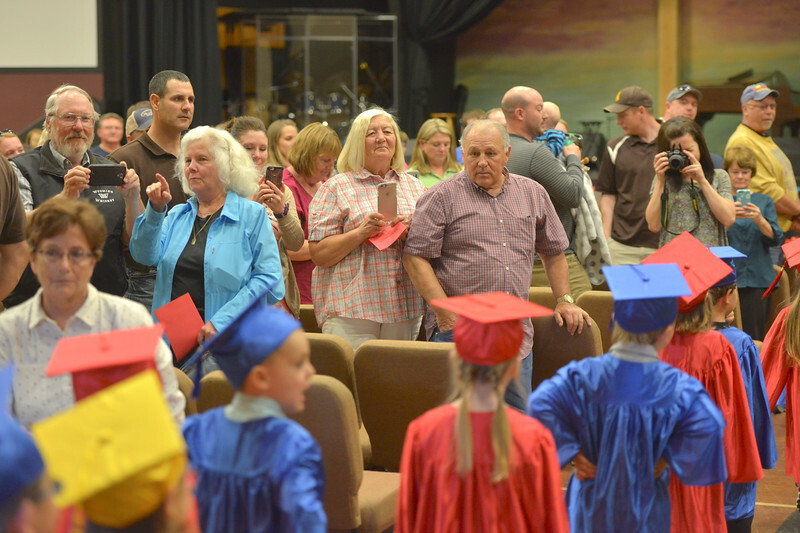 Family members watch their little graduates march inside during the Children’s Center annual Preschool Graduation Tuesday at Sheridan Wesleyan Church. The Children’s Center had 35 students graduate, which is the largest group the preschool held. 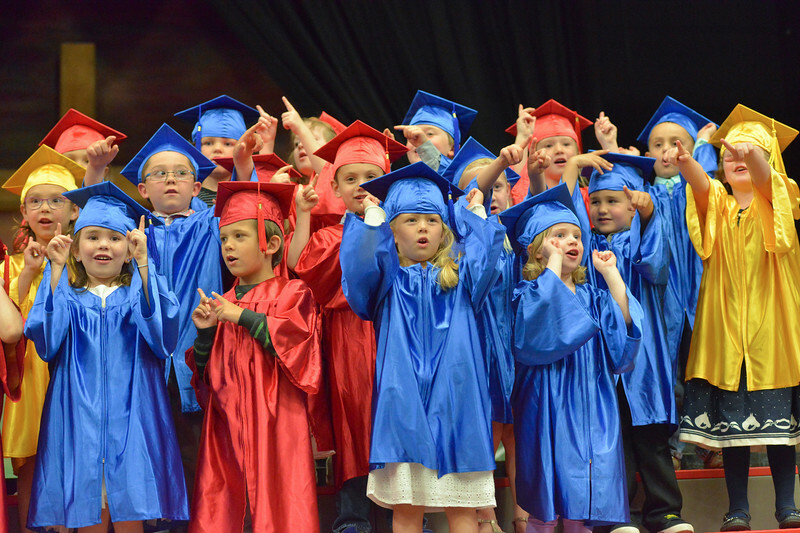 Graduates sing during the Children’s Center annual Preschool Graduation Tuesday at Sheridan Wesleyan Church. The Children’s Center had 35 students graduate, which is the largest group the preschool held. 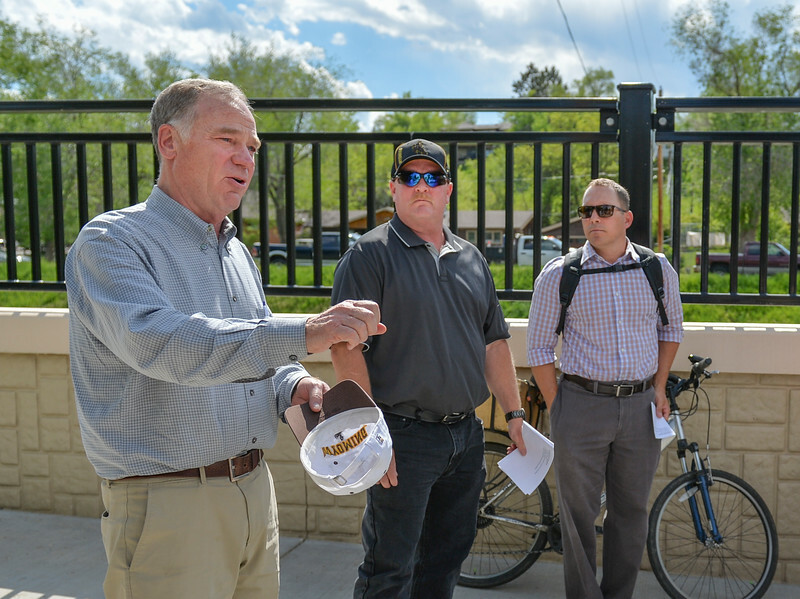 Wyoming State Senator, and former Sheridan Mayor, Dave Kinskey speaks about the pathway system during the ribbon cutting ceremony of the pedestrian underpass at 5th Street. To the right of Kinskey, Scott Taylor of WYDOT and Nic Bateson of the City of Sheridan. The $2.2 million underpass connects 8.5 miles of pathway with 10.5 miles of the pathway system. Previously pedestrians and bicyclists has to go down to Val Vista to safely cross 5th Street. 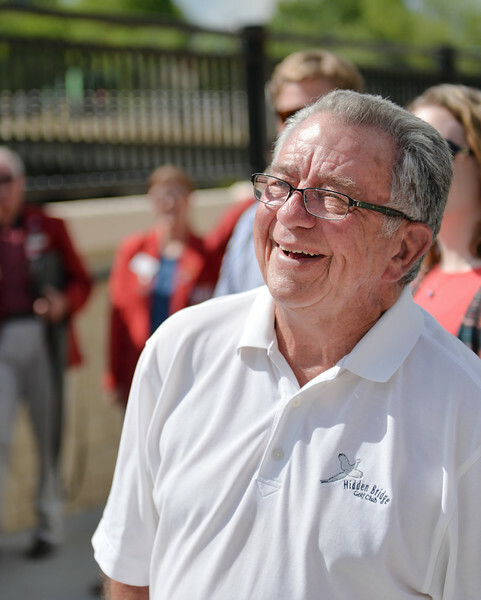 Former Mayor Jim Wilson reacts as Sen. Dave Kinskey speaks of him during the ribbon cutting ceremony of the pedestrian underpass at 5th Street. Mayor Wilson started the pathway system during his time in office. 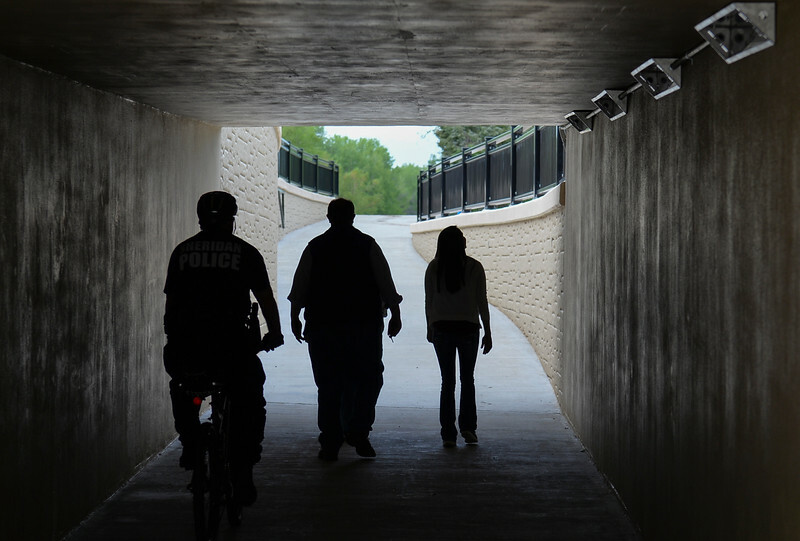 The $2.2 million underpass connects 8.5 miles of pathway with 10.5 miles of the pathway system. Previously pedestrians and bicyclists has to go down to Val Vista to safely cross 5th Street. 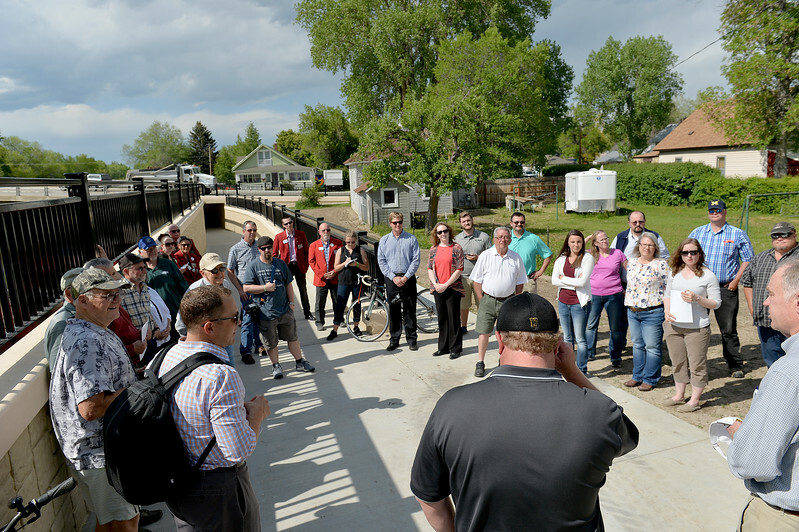 Community members, City officials and neighbors gather during the ribbon cutting ceremony of the pedestrian underpass at 5th Street. Mayor Wilson started the pathway system during his time in office. The $2.2 million underpass connects 8.5 miles of pathway with 10.5 miles of the pathway system. Previously pedestrians and bicyclists has to go down to Val Vista to safely cross 5th Street. 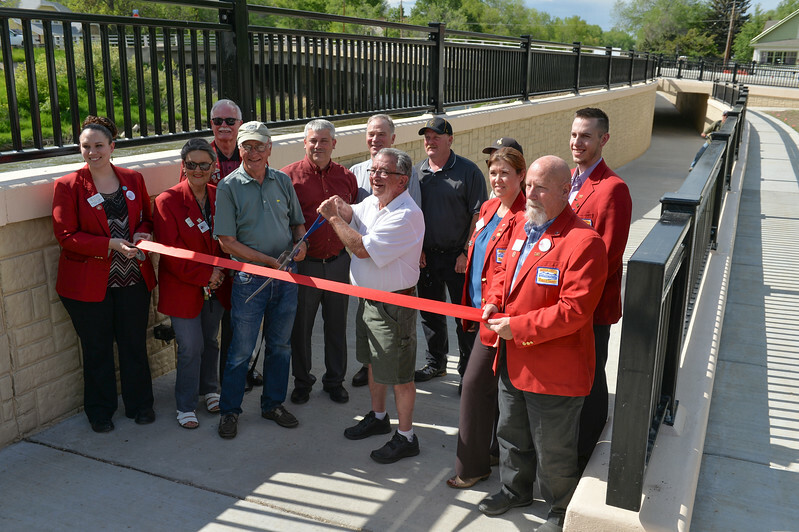 Pathway System committee member Bruce Pryde, left, and former Mayor Jim Wilson hold the scissors over the ribbon with ambassadors from the Sheridan County Chamber of Commerce during the ribbon cutting ceremony of the pedestrian underpass at 5th Street. To the right of Pryde, Mayor Roger Miller, Sen. Dave Kinskey, and Scott Taylor. The $2.2 million underpass connects 8.5 miles of pathway with 10.5 miles of the pathway system. Previously pedestrians and bicyclists has to go down to Val Vista to safely cross 5th Street. People walk under 5th Street during the ribbon cutting ceremony of the pedestrian underpass at 5th Street. The $2.2 million underpass connects 8.5 miles of pathway with 10.5 miles of the pathway system. Previously pedestrians and bicyclists has to go down to Val Vista to safely cross 5th Street. 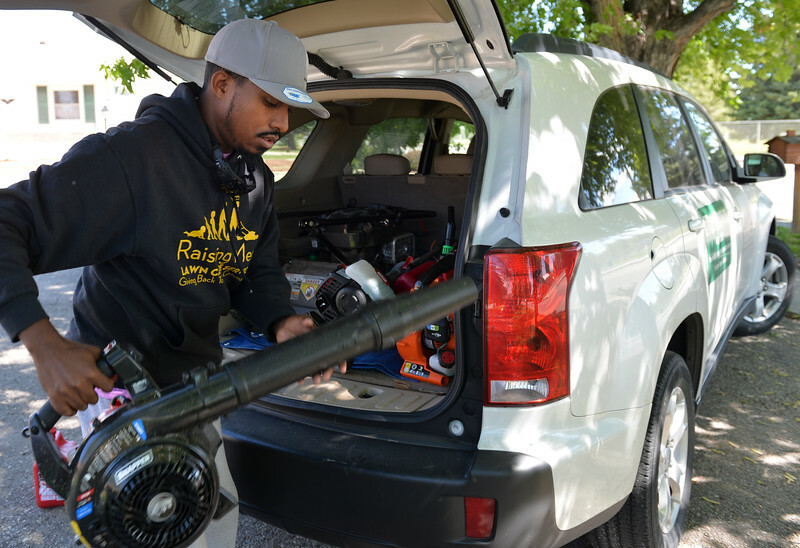 Raising Men Lawn Care Service founder Rodney Smith Jr. of Huntsville, Alabama, unloads equipment from the back of his vehicle Thursday at a resident’s home on Big Horn Avenue in Sheridan. Smith will mow one lawn in each of the 50 states of the union to motivate youth in helping their neighbors and community. 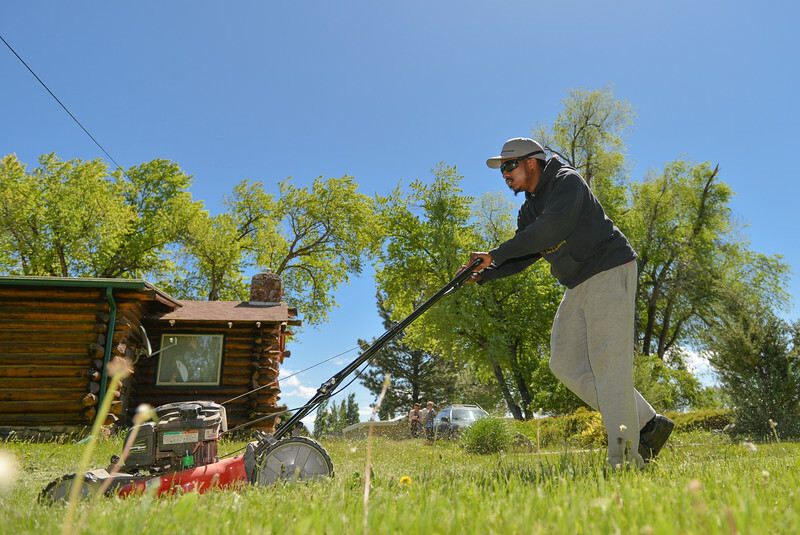 Raising Men Lawn Care Service offers a 50-Yard challenge that rewards kids with a T-shirt for every 10 yards mowed and a new lawn mower when they hit 50 lawns completed. Raising Men Lawn Care Service founder Rodney Smith Jr. of Huntsville, Alabama, installs a camera on his lawnmower Thursday at a resident’s home on Big Horn Avenue in Sheridan. Smith will mow one lawn in each of the 50 states of the union to motivate youth in helping their neighbors and community. Raising Men Lawn Care Service offers a 50-Yard challenge that rewards kids with a T-shirt for every 10 yards mowed and a new lawn mower when they hit 50 lawns completed. 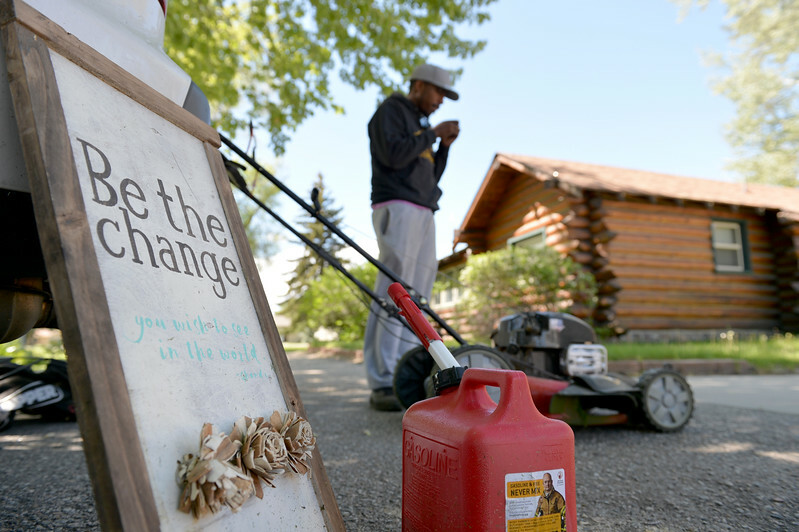 Raising Men Lawn Care Service founder Rodney Smith Jr. of Huntsville, Alabama, runs his lawnmower over the grass Thursday at a resident’s home on Big Horn Avenue in Sheridan. Smith will mow one lawn in each of the 50 states of the union to motivate youth in helping their neighbors and community. Raising Men Lawn Care Service offers a 50-Yard challenge that rewards kids with a T-shirt for every 10 yards mowed and a new lawn mower when they hit 50 lawns completed. 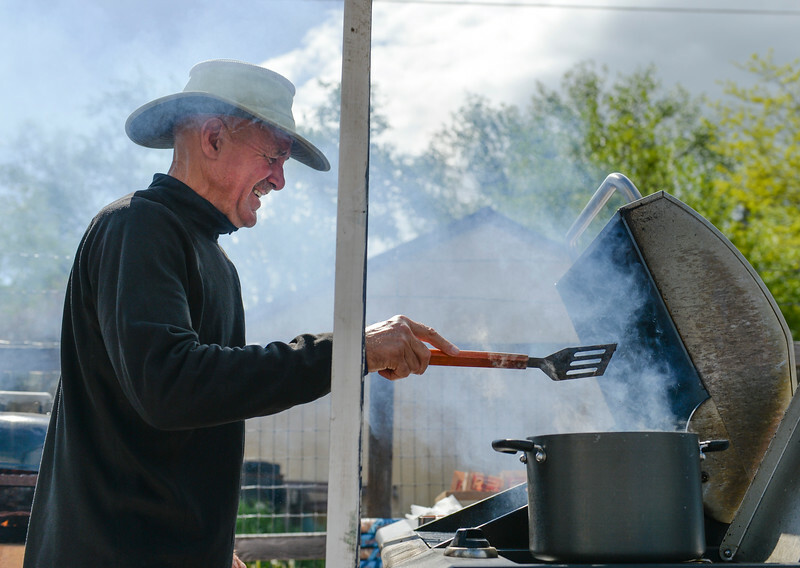 Greg Morris flips burgers during the After School Carnival celebration Thursday at the Tongue River Valley Community Center in Ranchester. The TRVCC offers an after school program for students in the Tongue River valley area. 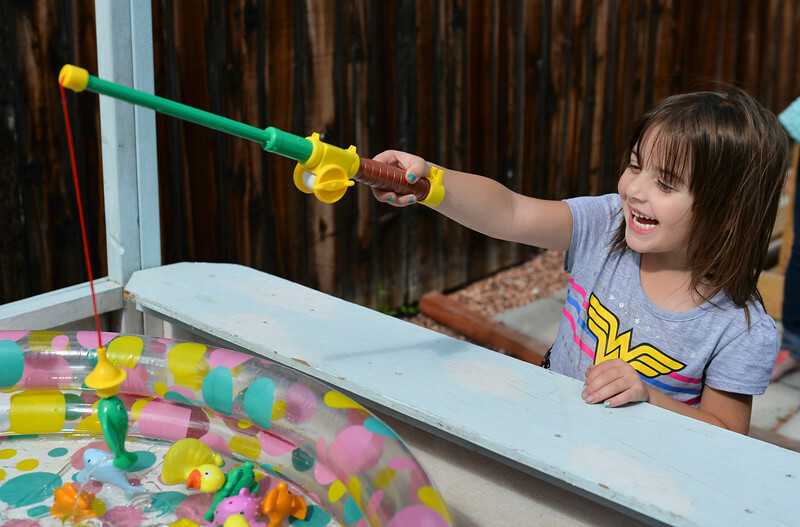 Five-year-old Cora Johnson hooks a fish to win a prize during the After School Carnival celebration Thursday at the Tongue River Valley Community Center in Ranchester. The TRVCC offers an after school program for students in the Tongue River valley area. 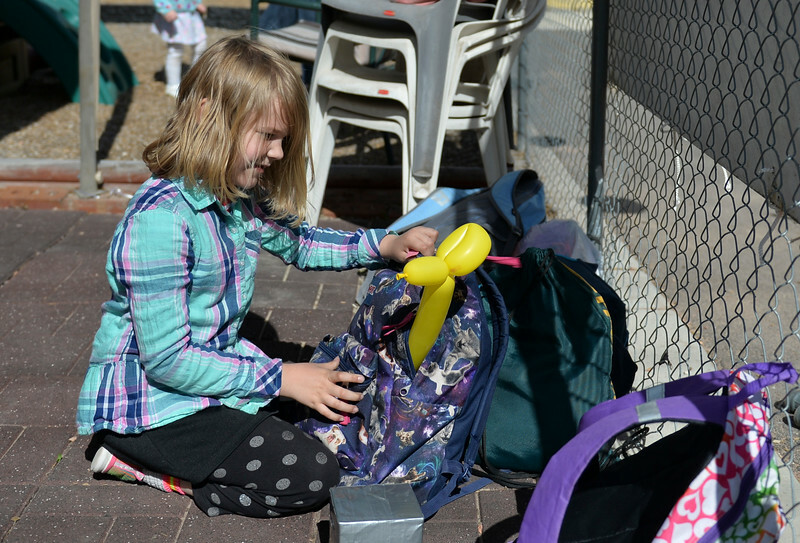 Second-graders Abigail Heser stuffs her balloon animal inside her backpack for safe keeping during the After School Carnival celebration Thursday at the Tongue River Valley Community Center in Ranchester. The TRVCC offers an after school program for students in the Tongue River valley area. 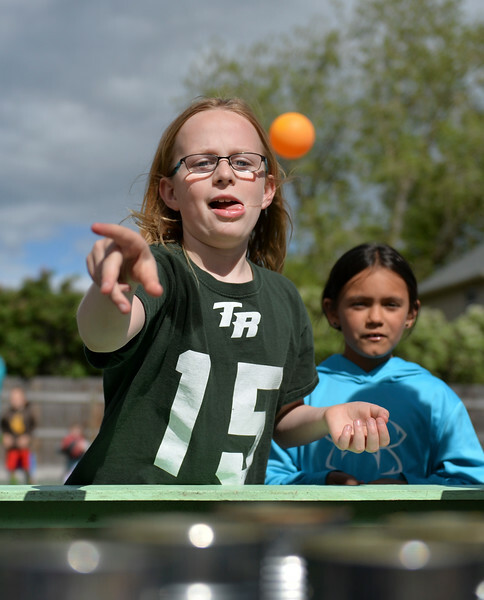 Nine-year-old Erika Stutzman tosses a ball at a set of cans to win a prize as Kaydence Morris watches during the After School Carnival celebration Thursday at the Tongue River Valley Community Center in Ranchester. The TRVCC offers an after school program for students in the Tongue River valley area. 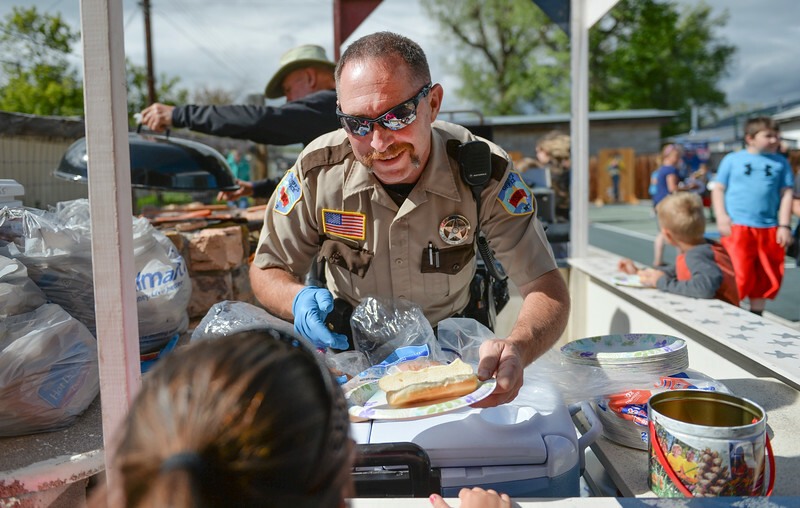 Deputy Boot Hill of the Sheridan County Sheriff’s Office hands a paper plate to a student during the After School Carnival celebration Thursday at the Tongue River Valley Community Center in Ranchester. The TRVCC offers an after school program for students in the Tongue River valley area. 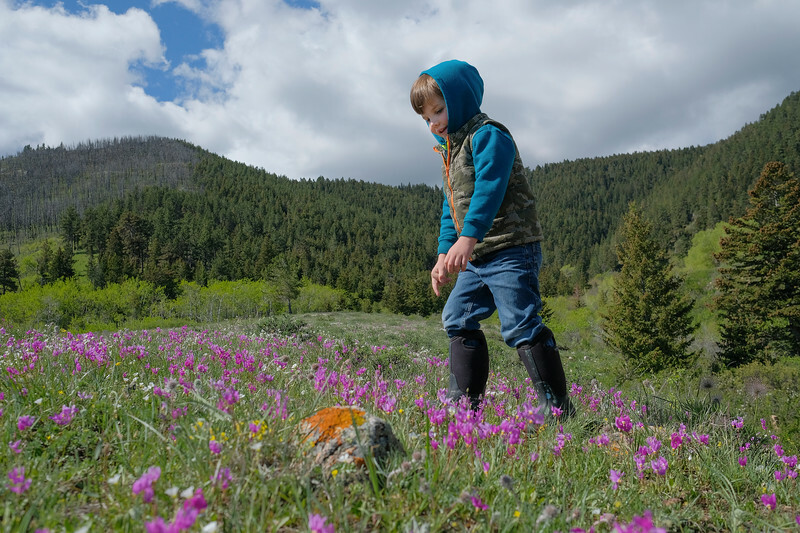 Four-year-old Oliver Houck looks at the wildflowers that blanket a field during The Sheridan Community Land Trust and Science Kids “Unplug” event Saturday at the Red Grade Trail System. Families were invited on self-guided nature scavenger hunts on the paths that crisscross the east face of the Bighorn Mountains near Red Grade road. 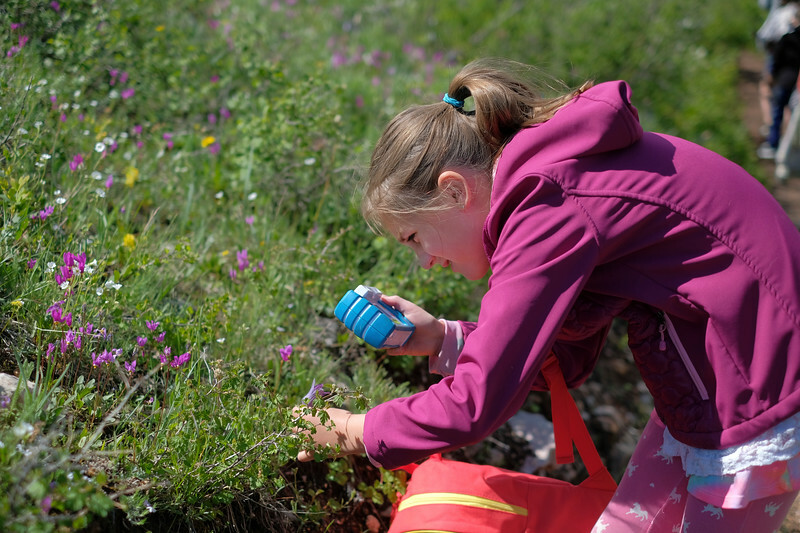 Eight-year-old Ada Newbrough snaps a picture of a wildflower during The Sheridan Community Land Trust and Science Kids “Unplug” event Saturday at the Red Grade Trail System. Families were invited on self-guided nature scavenger hunts on the paths that crisscross the east face of the Bighorn Mountains near Red Grade road. Molly Flint caries Matthew Fling, 2, during The Sheridan Community Land Trust and Science Kids “Unplug” event Saturday at the Red Grade Trail System. 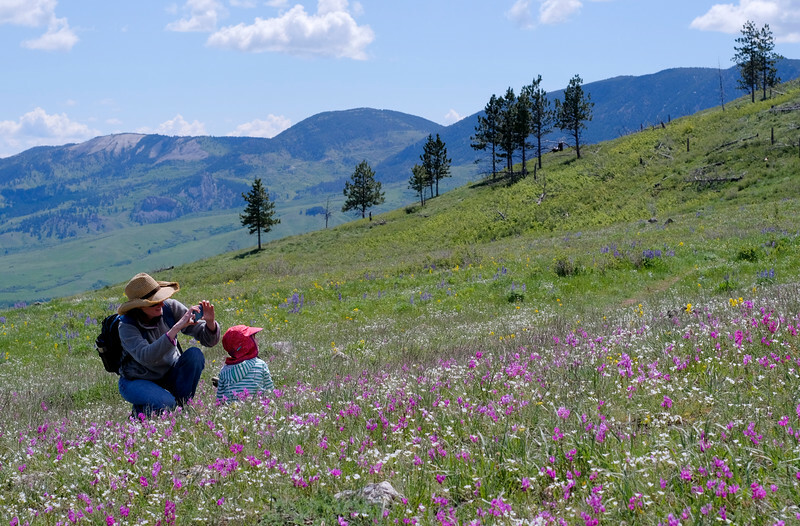 Families were invited on self-guided nature scavenger hunts on the paths that crisscross the east face of the Bighorn Mountains near Red Grade road. 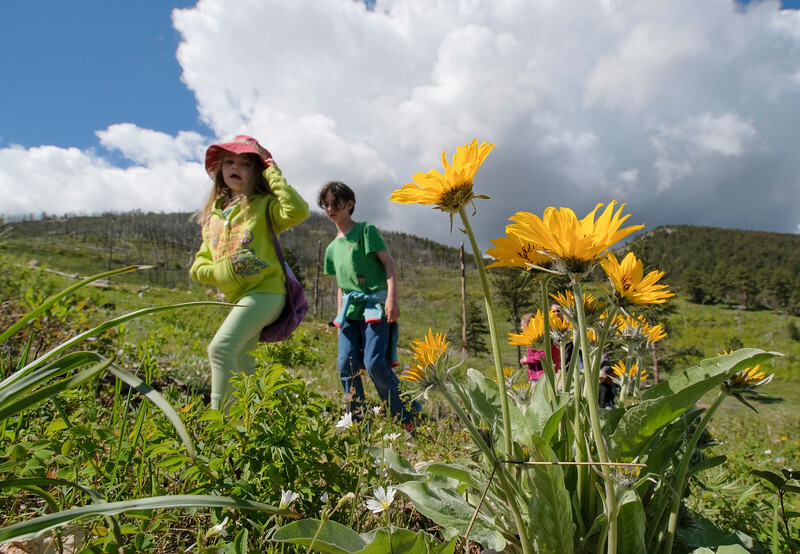 Four-year-old Evelyn Newbrough, left, and Megan Flint, 10, walk past Arrowleaf Balsamroot during The Sheridan Community Land Trust and Science Kids “Unplug” event Saturday at the Red Grade Trail System. 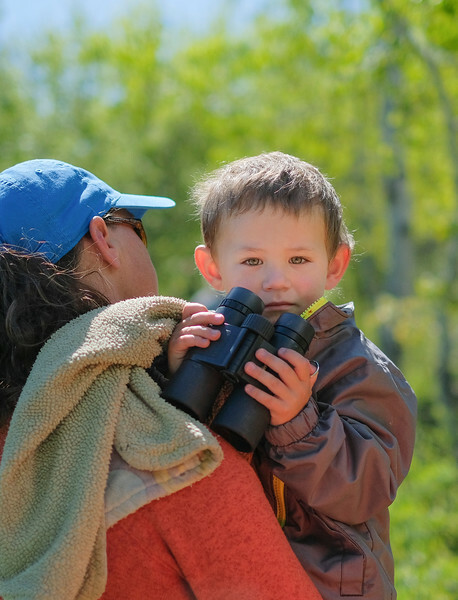 Families were invited on self-guided nature scavenger hunts on the paths that crisscross the east face of the Bighorn Mountains near Red Grade road. Mary Hogarty and Isla Hogarty, 4, snap pictures of wildflowers during The Sheridan Community Land Trust and Science Kids “Unplug” event Saturday at the Red Grade Trail System. Families were invited on self-guided nature scavenger hunts on the paths that crisscross the east face of the Bighorn Mountains near Red Grade road. 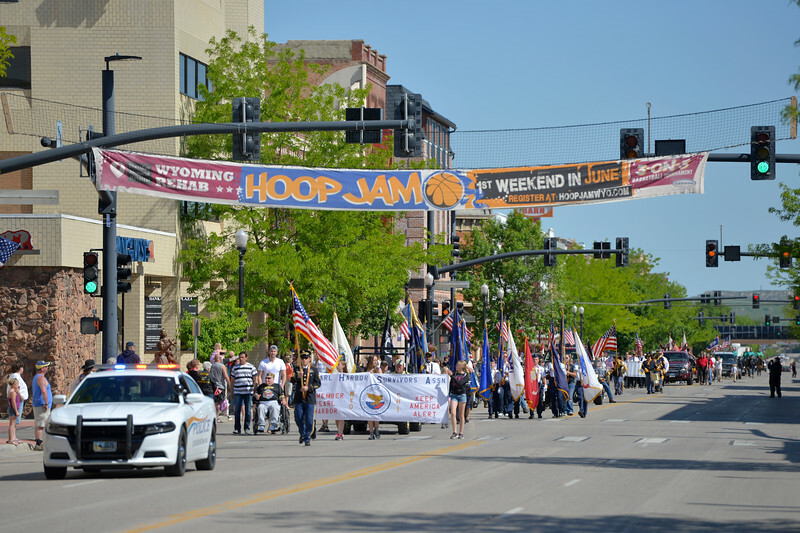 Parade participants march during the Memorial Day Parade Monday on Main Street. 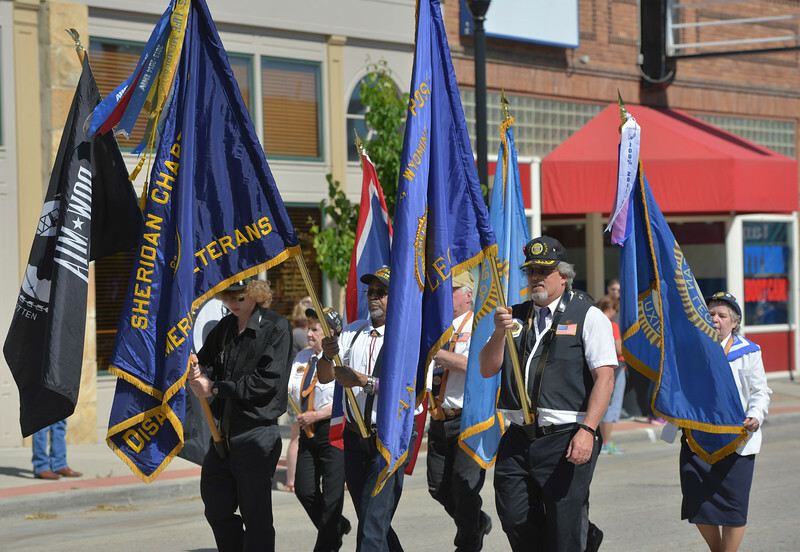 Flag bearers of local veteran chapters march during the Memorial Day Parade Monday on Main Street. 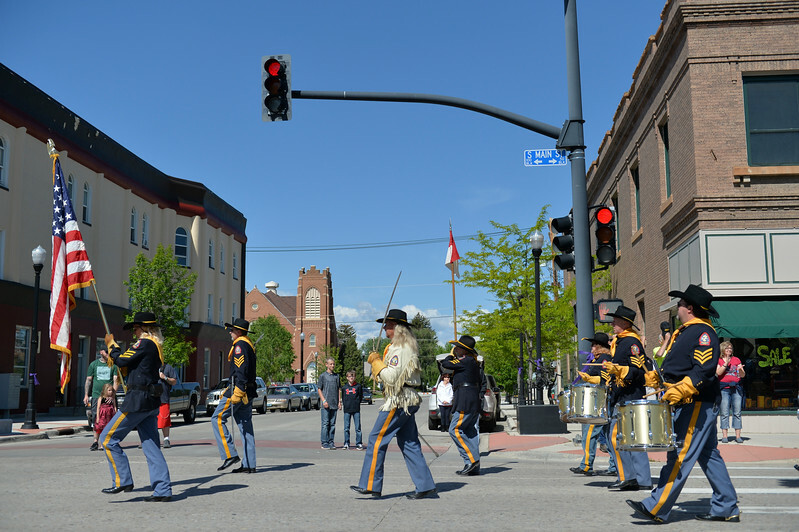 The American Legion Post 7 Drum and Bugle Corps marches during the Memorial Day Parade Monday on Main Street. 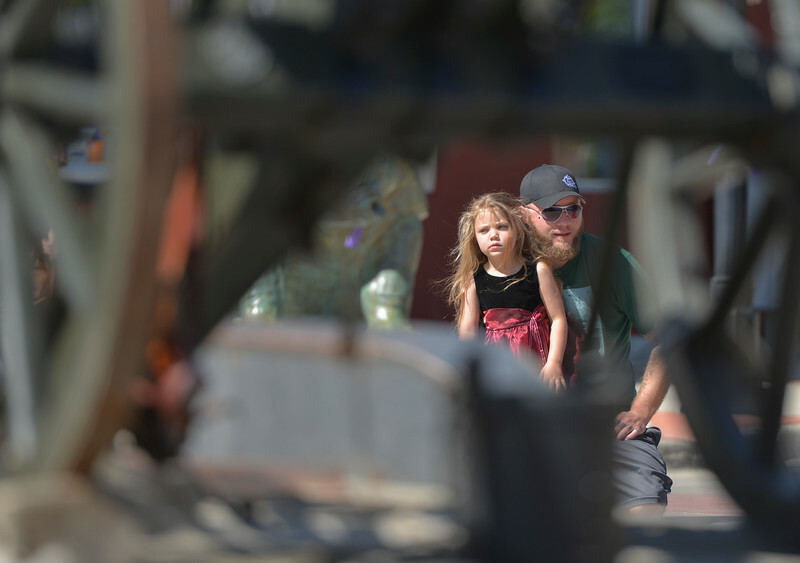 Five-year-old Rylee King and Levi King watch parade floats pass during the Memorial Day Parade Monday on Main Street. 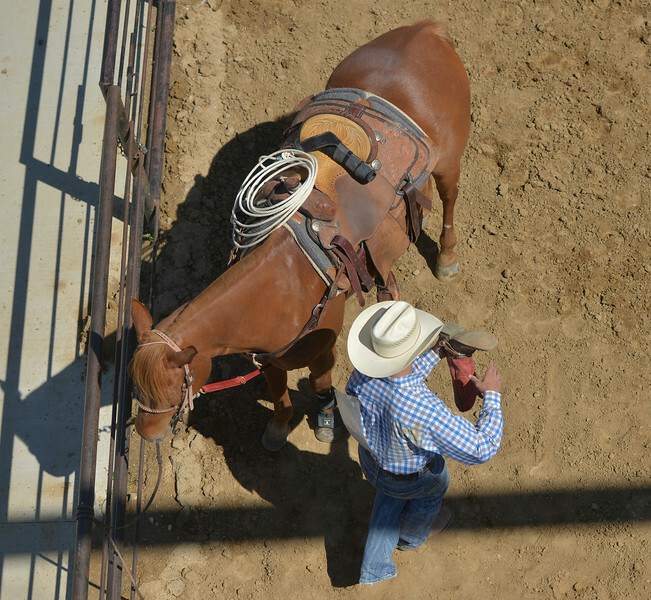 Dani Oedekoven of Gillette gets her horse ready for barrel racing during the Sheridan County high school rodeo Monday at the Sheridan County Fairgrounds. 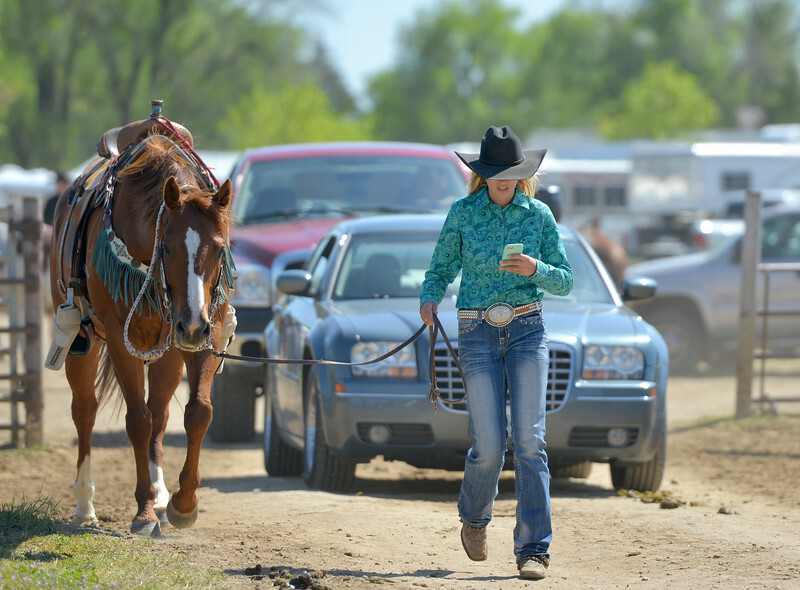 Emmy O’Connell of Gillette walks her horse to the trailer to cool off during the Sheridan County high school rodeo Monday at the Sheridan County Fairgrounds. 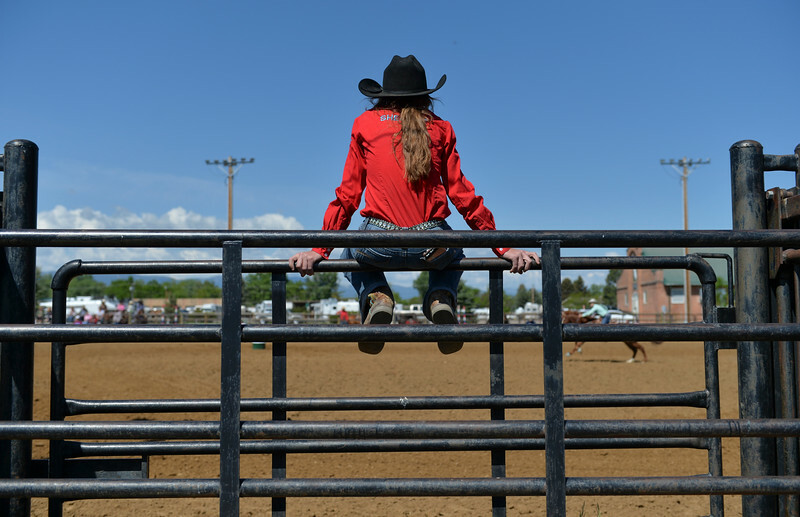 A Sheridan County student sits on the gate as a barrel racer competes during the Sheridan County high school rodeo Monday at the Sheridan County Fairgrounds. 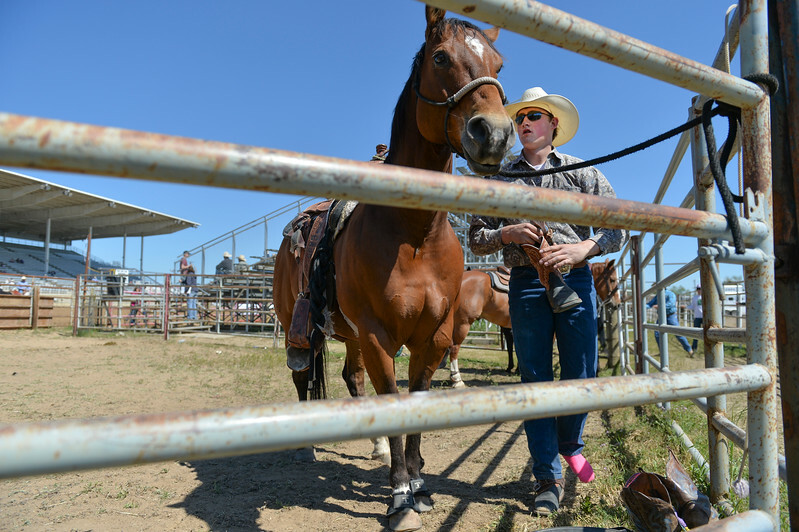 Ranner McInerney of Alzada, Montana, shakes out his boots during the Sheridan County high school rodeo Monday at the Sheridan County Fairgrounds. A competitor knocks out dirt from his boots during the Sheridan County high school rodeo Monday at the Sheridan County Fairgrounds. First-grader Haley Barker “arrests” school principal Deb Hofmeier during the end of school play day Wednesday at Tongue River Elementary School. The play day celebrates the end of the school year and was themed around school principal Hofmeier – who retires this week. 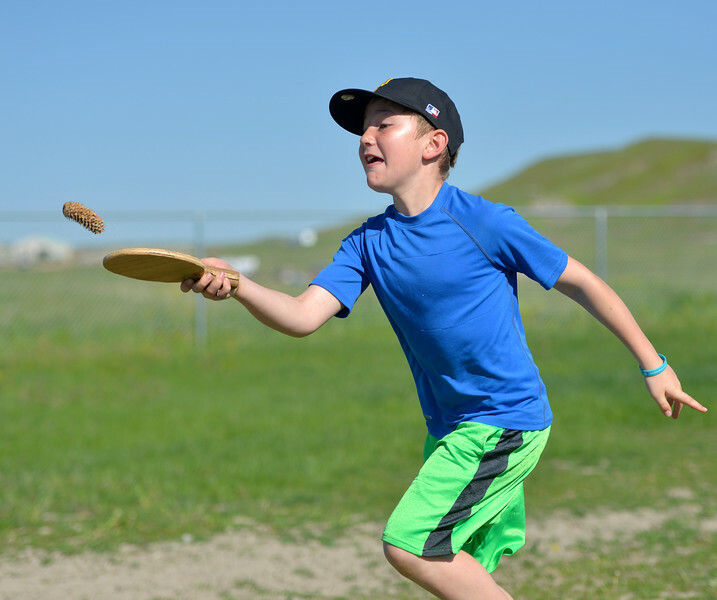 Third-grader Isaac Fritz runs a relay race while balancing a pinecone on a paddle during the end of school play day Wednesday at Tongue River Elementary School. The play day celebrates the end of the school year and was themed around school principal Hofmeier – who retires this week. 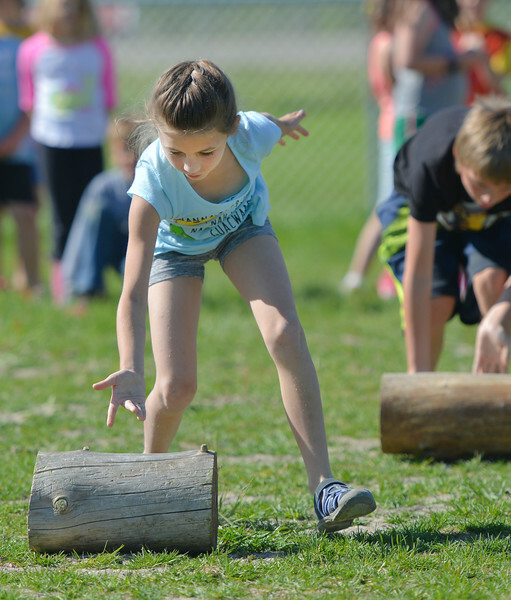 Second-grader Janie McDonald pushes log for a race during the end of school play day Wednesday at Tongue River Elementary School. The play day celebrates the end of the school year and was themed around school principal Hofmeier – who retires this week. 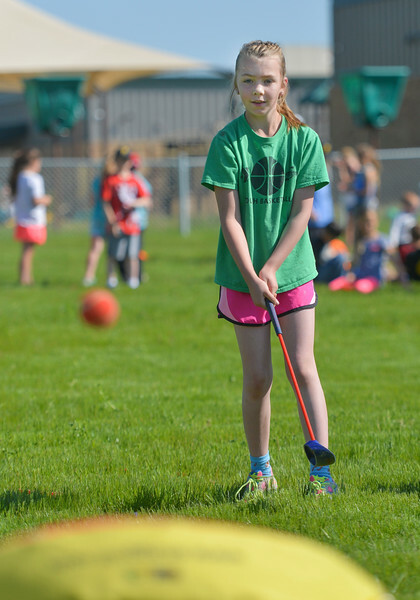 Third-grader Riata Peck chips in fuzzy tennis ball to a velcro target for a game of golf during the end of school play day Wednesday at Tongue River Elementary School. The play day celebrates the end of the school year and was themed around school principal Hofmeier – who retires this week. 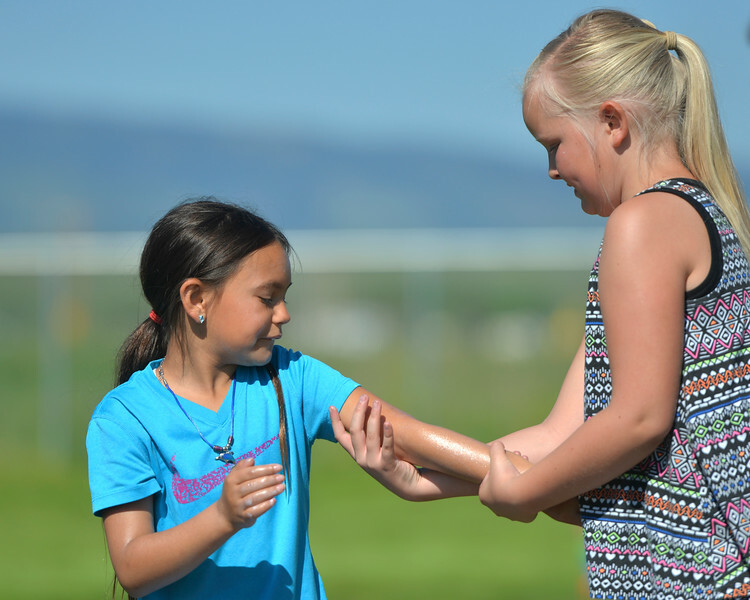 Third-grader Kaydence Morris, left, lets Joni Simonson rub sunscreen on her arm during the end of school play day Wednesday at Tongue River Elementary School. The play day celebrates the end of the school year and was themed around school principal Hofmeier – who retires this week. 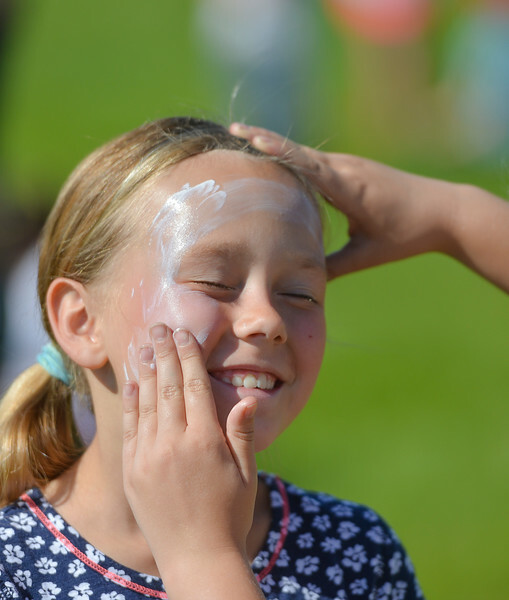 Third-grader Macey Homela has a friend help her with sunscreen during the end of school play day Wednesday at Tongue River Elementary School. The play day celebrates the end of the school year and was themed around school principal Hofmeier – who retires this week.